Hi all I am running one of my workflow courses in a couple of weeks time. I know there are a lot of people wanting to do one and this is probably my first in about 6 months. It has been a crazy time and being away so much hasn’t helped. So if you can make this date let me know. It is my usual workshop that I held all last year. I cover my workflow from capture to fine art printing. You get a workshop manual, free wine and desert and 19 years of experience. Will short track you to taking better photographs. 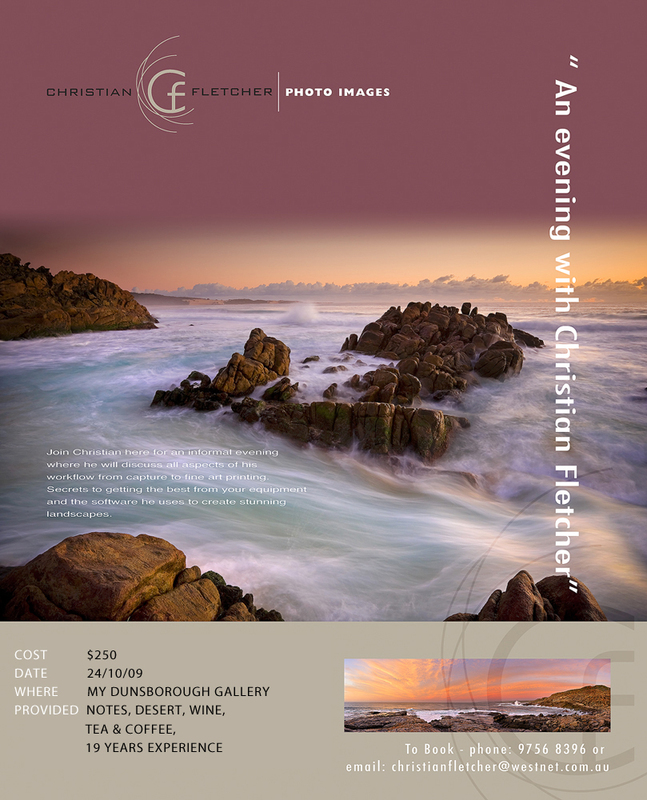 Cost is $250 and starts at 7.30pm at my gallery. Goes for 4 to 5 hours and is relaxed and fun, well I think it is!!! Check my blog for comments regarding the courses if you are unsure about the value of attending. ~ by christianfletcher on October 8, 2009. How come when I did it you only had 17 yrs experience ? thats because as you get older time goes quicker, don’t you know that Merv?? Plus I had forgotten to add the years of photography that I did before I became “pro”, so in actual fact it is more like 26 years experience, that sounds even better!!! Gee I knew I should have waited and got you when you were more experienced. Seriously , if anyone is thinking of doing this course then I can highly recommend it. I’ve actually done this twice ( I liked the wine ) and its well worth it , so do yourself a favour and get to the course if you thinking about. I’d love to attend but unfortunately I am already working that day. Hopefully I’ll be free for the next one. I’d love to attend but there’s the small issue of living on the other side of the country. May have to con my wife into a trip to WA sometime soon that just happens to correspond with one of your future courses. Get on board all you WA people would be a great experience. you never know Peter, it might be free!! Michael, WA is a great place to visit, probably has the best landscapes too! David, you in mate will send you more details soon. Fantastic Christian, looking forward to the Workshop very much! how to book for 24 oct workshop? Are there any spots left for the 24th workshop? christian thanks for your easy style and presentation at the workshop. Thoroughly enjoyed it. Also put me down please for the 6 nov pizza night.